Surrounded by the Olympic Mountains to the west and situated along the shores of southern Puget Sound on the Kitsap Peninsula, Mason County has blue skies above and forest greenery almost everywhere you look. 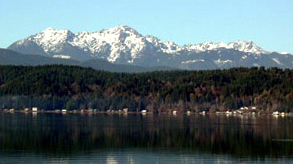 The inner banks of Hood Canal are a popular draw for all types of water recreation - shellfish gathering, fishing, boating, scuba-diving and swimming. With its 350 miles of unspoiled, uncrowded shoreline, abundant shellfish, rural and relaxing communities and endless scenic, recreational and cultural activities, it's easy to see why people choose to live in Mason County. Thurston County is located at the southern end of Puget Sound. Mount Rainier and the Cascade Mountains are nearby to the east, while Washington's Pacific Ocean Coast is just an hour's drive to the west. Thurston County is 60 miles south of Seattle, Washington and is 100 miles north of Portland, Ore.
Nearly 100,000 residents live in the more urban north county areas in and around the cities of Lacey, Olympia and Tumwater. The rest live in and around the smaller towns of Bucoda, Tenino, Rainier and Yelm, and in the more rural areas of Thurston County. Thurston County is the eighth most populated county among Washington state's 39 counties and is among the fastest growing counties in the Pacific Northwest.